That dire warning came last week from the former Greek finance minister, Yanis Varoufakis – he of the shaved head, the leather jacket and the powerful motor bike. In a week when most observers would probably agree that, right now, Brexit is the single biggest problem facing the EU, Varoufakis chose to remind us that it is by no means the only serious problem. Italy’s so-called expansionary budget proposals for 2019 seem to have set up an EU founding nation for a “showdown” with the European Commission – a showdown which, against the background of the growing tide of Euro-sceptic populism in Europe, could yet play into the hands of Italian deputy prime minister Matteo Salvini. We have all seen this particular movie played out before. An Italian government interprets EU budgetary guidelines “creatively”. The European Commission calls for corrections. Italy huffs and puffs but doesn’t blow the house down. Rather, it simply compromises. Even if the current Italy-EU crisis is severely straining relations between the two partners in the Italian government coalition, namely the once federalist Northern League and the Five Star Protest movement (M5S), there are plenty of reasons to believe that this crisis too will be resolved by some form of compromise. There is one significant difference, however. The EU has never before had to deal with an aggressively hostile, Eurosceptic Italian government. Furthermore, as one senior Brussels insider confirmed to the Sunday Independent last week, never has an Italian government had fewer friends in the Brussels establishment than right now. Dialogue will doubtless be difficult. 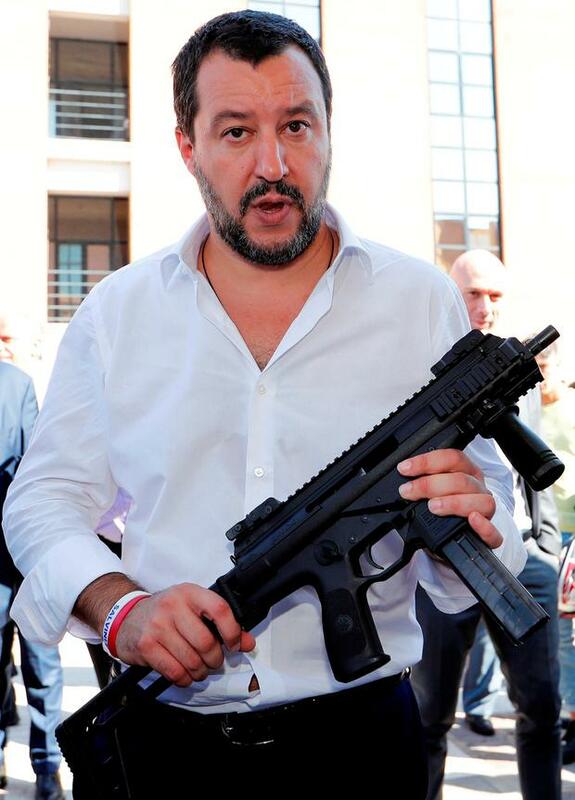 Take Salvini, for example, the man who within a week of taking office in June was already prompting a crisis in EU migration policy by shutting Italian ports to NGO boats full of “illegal” migrants. When the European Commissioner for Budget and Human Resources, German Gunther Oettinger, unofficially opened the Italy-EU crisis last Tuesday by telling Der Spiegel magazine that the Commission will most definitely be looking for “corrections” to the Italian budget for 2019, Salvini immediately responded, saying: “I have read Oettinger’s comments and I repeat that they should stop invading our pitch and just let the Italian government (get on with its) work”. Next day, in response to documentary evidence that French border police have been systematically dumping unwanted migrants into Italian territory during late-night “raids”, he attacked France’s President Macron in a tweet which said: “Macron, who presents himself as so good and generous, goes and dumps migrants in Italy at night. We will be expecting clear, immediate and unequivocal answers from Paris”. Macron has been a favourite Salvini target. In recent months, the Italian has called him “the new Napoleon”, “mad”, “a hypocrite”, “an educated gentleman who drinks too much champagne” etc. Now, most of us would probably agree that if you were about to go into a delicate negotiation with the European Commission, it does not make a lot of sense to insult the Commission president. Likewise, if you have an issue to resolve in Brussels, it is surely less than advisable to insult, in quick succession, Merkel, Macron and Juncker. Are they now sitting on the riverbank, waiting for the bodies to float by? This most recent bone of contention between Italy and the EU is the proposed Italian budget for 2019. Essentially the draft budget proposes increased social welfare spending via a measure to lower the retirement age from 67 to 62 as well as the introduction of an Italian-style “dole”, called a “reditto di cittadinanza” or citizen’s income. Such measures do not come cheaply and it required a forecast budget deficit of 2.4pc of GDP to meet the cost, rather higher than a previously mandated maximum deficit level of 0.8pc. Given that the Commission’s rules require that EU governments’ budget deficits should not exceed 3pc of GDP, there should be no problem, no? Well, actually, there is, given that the Commission argues that heavily indebted countries like Italy (its total debt of €2.7 trillion leaves it with a debt to GDP ratio of 132pc – the EU average is 80pc) should work towards a balanced budget where spending is equal to revenues. Not for nothing, one of the first negative observations about the Italian budget came last mid-week from Mr. Juncker, who said: “If we said yes to the Italian budget, some EU countries would cover us with insults and tirades, accusing us of being too flexible with Italy”. One body had just floated past. In other words, do not even think of it, Italy. And a second body had just floated past. Both men are looking to cash in on that at next summer’s European elections. Di Maio is predicting an “earthquake” at the European ballot box, whilst Salvini said last week that lots of his (far right) political friends want him to run for president of the European Commission next May, as the candidate for the Europe of Nations and Freedom (ENF) group. With just 36 members from nine countries, ENF is the smallest group in the European parliament. That, however, will not deter Salvini. When he took over the (then) Northern League in 2014, it had just picked up 4.9pc of the national vote in the 2013 elections. Under Salvini, that became 17.4pc at this year’s elections, second only to government partners, the M5S, on 32pc. Current opinion polls now suggest that the Lega would see its vote nearly double to over 30pc. Massive use of social media, masterminded by a 10-man team of “techies”, a Trump-like penchant for the populist, politically incorrect and a powerful gift of the gab have taken 45-year-old Salvini a long way. Clearly, for Euro-electoral purposes, a showdown with the Big Bad Bullies From Brussels represents a perfect populist campaign script. In the March general election this year, League leader Salvini promised to radically change the so-called “Fornero Reform”, in particular by lowering the retirement age from 67 to 62. In so doing, he claims, 400,000 people will now be able to retire earlier and thus make 400,000 new jobs available. Likewise, Di Maio campaigned hard for some form of dole in a country where, according to the national statistics agency ISTAT, five million people currently live in “absolute poverty”. Given the current climate in Rome, it is hardly surprising that when the Commissioner for Economic and Financial Affairs, Frenchman Pierre Moscovici, was in Rome last week, he opted to have a dialogue with the Italian state president Sergio Matarella and with the Minister for Economy and Finance, Giovanni Tria. Moscovici, of course, was there to serve a summons on Italy, pointing out that Italy’s 2.4pc of GDP deficit represents “an unprecedented deviation” from the EU’s stability and growth pact. Despite that, though he appeared to make comforting noises when saying that he could not imagine “Italy outside the EU or the EU without Italy”. However, is it possible that Yanis Varoufakis is correct when he says that disintegration could be on the way – not because of Italian budget creativity, but rather because of destructive EU austerity policies in a country which has the fifth highest public debt in the world and where infrastructure is literally and tragically falling to pieces – remember the Genoa bridge collapse in which 43 people lost their lives? Even as Salvini and Di Maio argue, and as we wait for the Commission to come to some sort of compromise with Italy, the infamous markets have already been having their say. Late on Friday, ratings agency Moody’s cut Italy’s sovereign debt rating to one notch above junk status because of concerns over government budget plans. Still, a nagging doubt remains. Could Varoufakis be right when he says that EU policies simply “don’t work in Italy”?